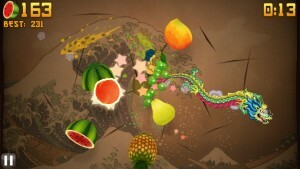 Halfbrick Studios has released a new version of its most popular game, Fruit Ninja. The new version features two new swords, ‘The Rock Blade’ and ‘The Princess Blade’, and all the fun of previous editions. In 2012 Fruit Ninja had already reached 300 million downloads and was in one of three U.S. iPhones. This popularity is fully deserved. The game is available for all platforms at the reduced price of one dollar. This price may be one of the keys to success, along with the addiction it causes. Furthermore, we can make the cuts with awesome accuracy. This turns the game into something much more realistic and the special combos can be performed more easily. 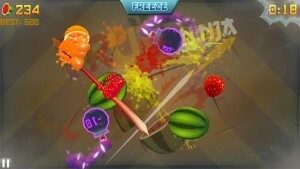 In a game of Fruit Ninja, the player has to slice the flying fruit that cross the screen. If there are any fruit left, we lose a life, and if we slice a bomb, the game is over. When cutting several fruits together, we form combos that multiply the score. Fruit Ninja features different game modes. The classic mode starts with three lives, that we lose when we left fruit uncut. This mode also has 3 special bananas, which give us special bonus. In arcade mode you try to get the highest score in one minute, while in Zen mode we have two minutes to obtain the maximum amount of points. In this mode, we don’t need to worry about the bombs. Finally, there is also the possibility to play multiplayer online, but is only available for iOS devices via Apple’s Game Center. It is a fun, simple and highly addictive game. You can download Fruit Ninja for Android, iOS (iPhone and iPad), Amazon Kindle, Windows Phone and Windows 8. In addition, in the Google Play Store there is a free version for Android devices. You must try it!